I delayed this post as I truly want my trial and experience to help inform and hopefully inspire friends to make their own changes, no matter how small. I only focused on covering daily swaps I made during my challenge. If I didn’t have to try and replace it, I didn’t cover it. Many swaps I did make were so easy! While a few I found extremely difficult. The photo above is every single use slip up or things I finished off and tried to replace.. I was no where near perfect, I still am no where near perfect OR Zero waste nor do I expect this post to make you want to be. There truly are items that have no good substitutes. The point of this post is hopefully to help those who want to make a chance realize how possible so many changes are. I won’t be perfect, nor will you, but everyone together can influence a positive change in that direction. When it comes to decreasing single use plastic the world is woke to the basics at least in idea of not practice, there are tons of easy daily swaps. Just buy once and bring it with you!! My Fav Reusable Bag: Baggu It comes in cute patterns, it’s cheap, and mine has lasted me over 5 years so far. No rips. No tears. Produce Bags: Amazon has endless choices for every price range. Any will work. Spice Bulk Section: I keep bags and reuse or old spice bottles when they empty. And Coffee Cups. Insulation wins again. And Straws: Metal is my best frand. Collapsible Tupperware is where it’s at. These are my exact ones. No regrets. To-Go Ware: My Fav Bamboo Utensils but metal and wood are great too. **when it came to an ice cream scoop and small straw I just kept ones I accidentally ordered and now don’t use anymore. I keep my straws, utensils, and sandwich bag in an easy to grab pouch together. Pack Lunch To-Go or bring your to go box. 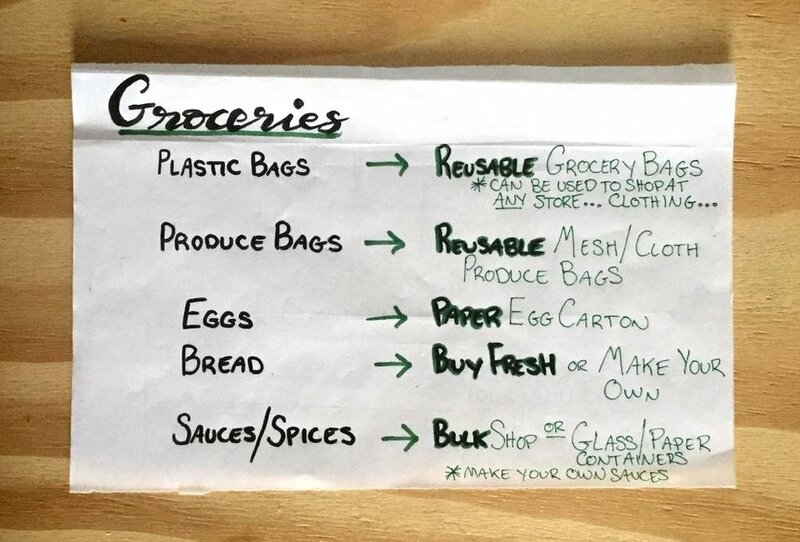 Grocery: I keep Grocery Bags, Produce Bags, Reusable Tupperwear, and Bulk Item Containers together. Every time I’m done with them I stick them together to grab each week when I shop. Simple and less thought then leaving them all over the kitchen. Just grab-n-go. These lack an abundant source from which to purchase, require a bit of searching but then are easy to swap. Bulk Items: I just save old containers and jars from foods I already ate, olives are the best or use Tupperware. Metal Tupperware is the latest reusable trend for great storage. Solid Shampoo, Conditioner and Shaving Bars: LUSH and Ethique are highly recommended . Stay tuned for my review. Sunscreen: On my list- Avasol and All Good. Both protect you and the Reef!! Just remember You’re Saving The World and they’re Caving to Convenience. Its so easy to be deterred by the “ew dirty hippy” looks or scoffs at you seeming “extra” but there is nothing wrong with wanting to help our earth. We only get one. We need our culture to demand more things that help conserve it. Those who make fun are either guilty they don’t do enough or truly don’t realize the danger our world is in. Our small changes can influence those around us and eventually society as a whole. So keep it up! Every change counts, particularly your own opinion for the opinion of others. But really. There are so many daily things that just do not have good or easy swaps, or even any at all. And the below list are harder to find many swap options, or I couldn’t find one at all. I haven’t gotten to the DIY party of helping the world, but one day…. Until then these are def on the hard to swap list. I hear toothpaste is easy to make but I just don’t trust it yet ha! I am not conning you. Plan Ahead. You have to think ahead and bring the reusable items with you to avoid the single use. Space. Bringing them all with you can take up some space. But with each single use item you don’t throw away that’s more space in the ocean for animals to be plastic free. But really if that is all you have to complain about you’re doing pretty good. Is decreasing waste a Privilege? There is a huge discussion out today about Zero Waste being a privilege, how it can be expensive. But that is NOT the case for lowering your waste. There are SO many cheap and even money SAVING options to decrease your waste. Many swaps may seem to cost you more money in the moment, but really over time they save you money. Think if your reusable water bottle costs $15. But you use it for years. Instead of buying a water bottle for $1 or more every day that could be $365 or more saved in just one year. It may cost you more initially but will pay for itself and more. I may post on that another day breaking down what items save money. But if you won’t swap for the animals and our ocean, do it for your wallet.